You'd never know that I was 6 months pregnant and she had cancer, no? We had our haircut yesterday, so we figured this would be a good opportunity to show the world just how well my mother is doing. For a more in focus photo, check out my mother's blog. Today is a Baha'i Nineteen Day Feast, which I'm still getting used to again (since they don't happen in Haifa). We're hosting and it's potluck! Yum! Which brings me to my final topic. Pregnancy, I think, is just about the weirdest thing that has, or probably ever will, happen to me. I have another human growing inside of me. Inside. Of Me. It's rather difficult to wrap my head around it - to really convince myself it is for real and happening to me. Not that I ever had difficulty believing it was happening to someone else. Weird. That's as far as I've gotten. Hmm, appears it's been a while. Well, since Mark arrived, we have spent a lot of time visiting family and friends. And I got a mighty chest cold. Not to mention Christmas. However, I will mention my birthday. Which was fabulous. My parents, Rachael, Mark and I went out to the Cedar Lee (the art house cinema in the area) in Cleveland to watch Sweet Land. As you may or may not recall, I have wanted to see this movie for about three months, ever since it came to the Haifa Film Festival, which I missed due to some serious nausea. The movie was absolutely wonderful - so wonderful that every single one of us enjoyed it! I would recommend it to everyone really. REALLY. After the movie we went over to the Mad Greek, which, for some reason, specializes in both Greek and Indian food. Whatever. But it was yummy and fun and we all had a good time. Finally, my mother just finished knitting me a "Mommy Snug" sweater. She put the buttons on that I chose and then we had a photo party, so go check them out at her blog. True to her word, my mother took updated photos of my ever-expanding belly last night in order to satisfy the starving masses (you know, all two of you...). Anyhew, feel free to check out the poser on her web site. Last night, our family went out to see Stranger Than Fiction together. We all really enjoyed it - from age 22 to 58 (ok, I'm not sure everyone stayed awake thru the whole thing, but what was seen was enjoyed). On the way out, I stopped in the ladies' room. Two cinema employees were in the stalls next to me. As one young women stepped out of her stall, she must have checked herself out in the mirror because the next thing she uttered was, "I have Texas hair." I immediately thought of you, Mel, and then she followed up with what really made it funny, "My head is three times bigger than it should be." Oh, p.s. : I (we) went to my first midwife appointment this side of the Atlantic this morning. I'm so happy I'm going to be giving birth with this practice. The midwife was awesome. 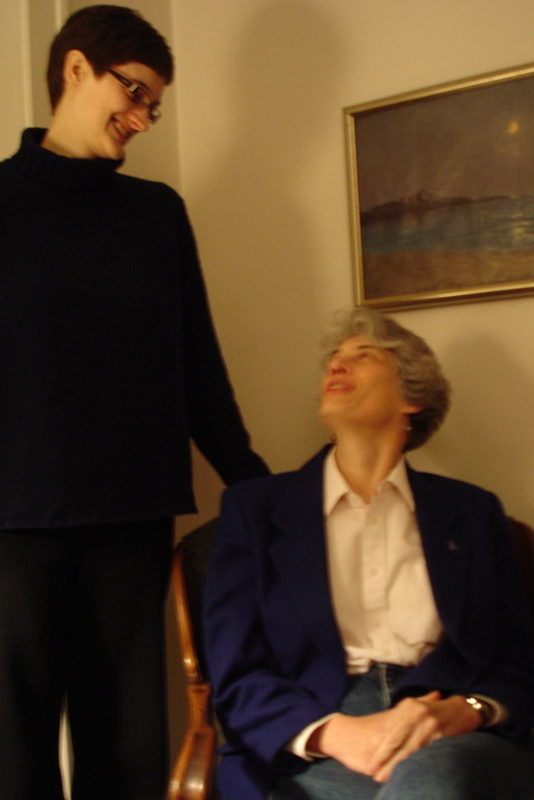 Not only was she professionally capable, but she grew up in Evanston (which is where the Baha'i house of worship is in the US), has hosted midwives from Israel and totally included Mark in the meeting. She also informed us that I could even do a water birth at the hosptial, which I think is pretty cool. It is such a relief to know I like the people who will be with me during the labor and delivery! Upon returning home from delivering further-requested documents for Medicaid, I found 5 letters from the government - informing me I'd been accepted for Medicaid (umm, that was fast?! or, rather, then why did they need those other documents? anyway, doesn't matter, I got what I wanted). So, yes, 5 letters. 3 were unsealed. One of them, I kid you not, has already expired. Turns out I was covered for November. Gee, thanks. Finally, my favorite. Medicaid requires that I belong to an 'MCP' or managed care plan - whatever, it means that basically they are outsourcing me to a health insurance provider. So, I have to choose one. They give me a web site to go to in order to check out my options. The web site ends, again I kid you not, in "con-man-care.stm".